Photo of Michael’s cracked skin before P.O.L. and after 3 weeks of using CABOT P.O.L. 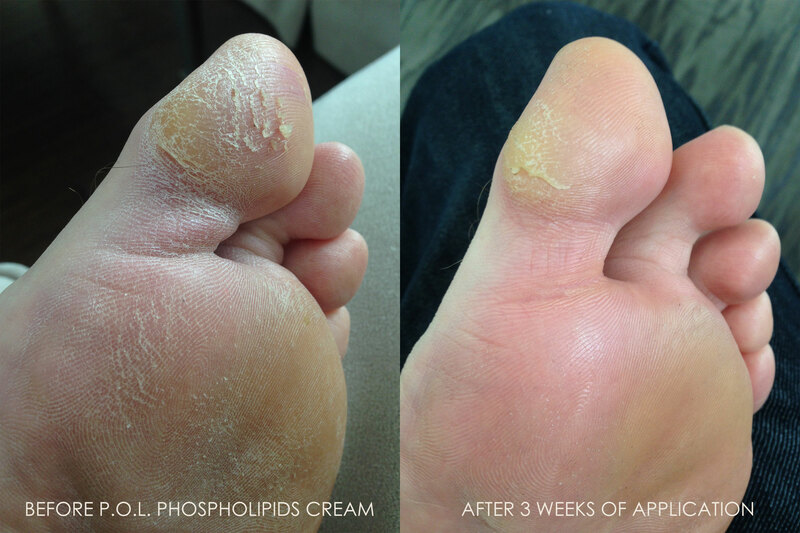 Phospholipids Cream. P.O.L. Cream is formulated to deliver the proven benefits of Phospholipids – powerful natural antioxidants and the chief moisturizing agent in the skin which penetrate the skin to provide long lasting moisturizing and protection – to provide safe and effective treatment and protection of dry, cracked skin. Phospholipids are the prime building blocks of all forms of life – and thus Phospholipids are indispensable to all forms of life and healthy skin: assembling and strengthening skin cell membranes, stimulating microcirculation and accelerating the natural healing of superficial and serious traumatized skin. Cracked skin can be painful and dangerous by opening skin to bacteria and infection. Skin cracks often begin with dry skin and develop into more serious and complicated conditions if not attended to. Skin cracks are often the first sign ofdiabetes, peripheral artery disease and peripheral vascular disease. For people with diabetes, high blood glucose from diabetes can lead to nerve damage (neuropathy), causing a lack of sensation and leaving feet and hands vulnerable to injury. A cut or sore may lead to infection without immediately obvious symptoms. As many as one-third of people with diabetes will have a diabetic skin disorder that can be effectively prevented and treated. Warning: Diabetes can lead to lower limb amputations- 85% preventable! People with peripheral artery disease and peripheral vascular disease have poor circulation which makes sores or infections slow or hard to heal. P.O.L. Cream also delivers two other natural lipids, glycolipids and ceramides and contains the antioxidant vitamins A and E to protect and promote skin repair. Healing and soothing Allantoin helps maintain skin health. Hyaluronic Acid attracts and retains moisture, while Dimethicone and Glycerin protect, condition, and hydrate skin. P.O.L. Cream is steroid-free and antihistamine-free, so you can use it as often as needed. Can be used without a prescription or a doctor’s order. Non-greasy formula will not stain clothing or bedding.